Honey has a long and distinguished history in the human diet. For thousands of years honey hunters have plundered the hives of wild bees for their precious honey and beeswax — a practice still common today. The most widely used honeybees are the European Apis mellifera, which have now been introduced worldwide. Tropical Africa has a native Apis mellifera, which is slightly smaller than the European Apis mellifera, and is more likely to fly off the comb and to sting. They are also more likely to abandon their hives if disturbed, and in some areas the colonies migrate seasonally. There are three different kinds of bees in every colony: a queen, the drones, and the workers. The queen’s job is to lay eggs, as many as several hundred in a day. These larva develop into drones, workers, or new queens, depending on how the workers treat them. Drones are the only male bees in the hive, and their main function is to mate with a virgin queen outside the hive. They die after mating. They have no sting, do not carry pollen, are unable to produce wax, and when resources are scarce they can be driven out of the hive to die. The all-female worker bees, make up about 98 per cent of the colony, and they do almost all the work. They bring water, pollen, nectar, and propolis (bee glue) back to the hive, while some remain to guard the hive, and some clean it, build the wax comb, nurse the young, and control the temperature of the hive. Workers eat honey to produce heat in cold weather and fan their wings to keep the hive cool in hot weather. Their legs are specially equipped with pollen baskets, and they have glands that produce wax on their abdomens. The worker has a sting, but usually dies after stinging anything. A honey bee nest consists of a series of parallel beeswax combs. Each comb contains rows of wax with hexagonal compartments containing honey stores, pollen, or developing bee larvae (brood). To thrive and produce honey the bees need adequate supplies of nectar, pollen, and water. The combs are evenly spaced and are attached to the ceiling of the nest.The space between the faces of the combs is known as the ‘bee space’; it is usually between 6 and 9mm and is critical in maintaining optimal conditions within the nest, with just enough space for bees to walk and work on the surface of the combs while maintaining the optimum nest temperature. Beespace, dimensions of combs, and nest volume all vary with the race and species of honey bee. 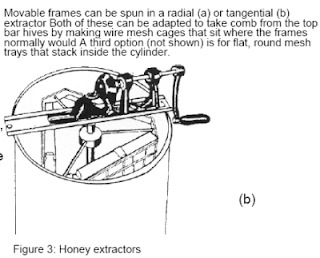 The bee-space is a crucial factor in the use of bee equipment, and honey bees cannot be managed efficiently using equipment of inappropriate size. Bees need a supply of food and water to live, and during dry periods the beekeeper may have to supplement natural sources. As a general rule, attempts to begin beekeeping should start with the area’s existing bees, techniques, and equipment, which will all have been adapted for the local circumstances. Most of the equipment needed for small-scale beekeeping can be made at village level. It can be helpful to import basic equipment to serve as prototypes for local manufacturers. For practicing on a large scale, some specialized equipment will probably need to be bought, such as honey gates, special filtering gauze, and gauges to determine honey quality. A beekeeper uses a smoker to produce cool smoke to calm the bees. 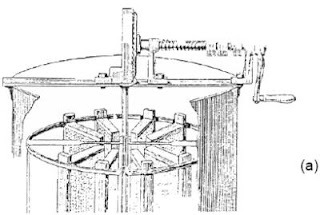 The smoker consists of a fuel box containing smoldering fuel (for example dried cow dung, hessian, or cardboard) with a bellows attached. The beekeeper puffs a little smoke near the entrance of the hive before it is opened, and gently smokes the bees to move them from one part of the hive to another. 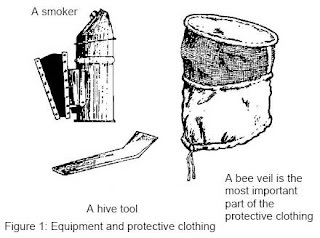 Adequate protective clothing gives beginner beekeepers confidence, but more experienced beekeepers find that too much protective clothing makes it difficult to work sufficiently gently with the bees, and it is very hot. Always wear white or light-colored clothing when working with bees – they are much more likely to sting dark-colored clothing. It is most important to protect the face, especially the eyes and mouth; a broad-rimmed hat with some veiling will suffice. Individual items of clothing must be impermeable to bee stings, and every joint between them must be bee-tight; rubber bands can prevent bees from crawling up trouser legs or shirtsleeves. Some people find that a good way to protect their hands is to put a plastic bag over each hand, secured at the wrist with a rubber band. Figures 2 above-left: A Kenyan top-bar hive. This is suitable for African bees but may adjusting for Asian or European use. Any wood that is resistant to sun and rain and will not warp is suitable. These are made from whatever materials are available locally: typically hollowed-out logs, bark formed into a cylinder, clay pots, woven grass, or cane. They are used to encourage bees to nest in a site that is accessible by the beekeeper. The bees build their nest inside the container, just as they would build it in a naturally occurring cavity. Eventually the beekeeper plunders the nest to obtain crops of honey and beeswax. Bees may or may not be killed during this process, depending on the skill of the beekeeper. If the colony is destroyed, the hive will remain empty for a while. If there are plenty of honey bee colonies in the area, then eventually a swarm may settle in the empty hive and start building a new nest. Traditional beekeepers often own 200 hives, and expect only a proportion of these to be occupied by bees at any time. 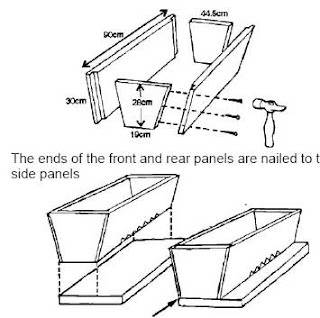 Frame hives must be constructed with precision. Frames are contained within boxes and each hive consists of a number of boxes placed on top of each other. Often a ‘queen excluder’, a metal grid with holes that allows only the smaller worker bees to pass through, is used to isolate the brood in the bottom-most boxes. The rest of the boxes will contain only honey. Intermediate technology hives combine the advantages of frame hives with low cost and the ability to manufacture locally. The hive consists of a container with a series of ‘top bars’, on which the bees are encouraged to build their combs. These top bars then allow individual combs to be lifted from the hive by the beekeeper. The containers for the hives may, like traditional hives, be built from whatever materials are locally available. Top-bar hives can also be kept near the home and moved between flowering crops, enabling women to keep bees. 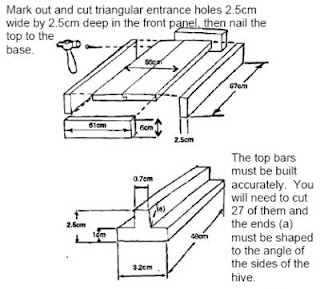 The only items in the top-bar hive which need to be built with precision are the top bars themselves; they must provide the same spacing of combs within the hive as the bees would use in their natural nest. The natural comb spacing is the distance between the centers of adjoining combs, and this spacing will depend upon the species and race of honey bees which are being used. As a very general guide, Apis mellifera of European origin need top bars 35mm wide, Apis mellifera in Africa need 32mm, and Apis cerana in Asia need 30mm. The best way to determine the optimum width is to measure the spacing between combs in a wild nest of the same bees. 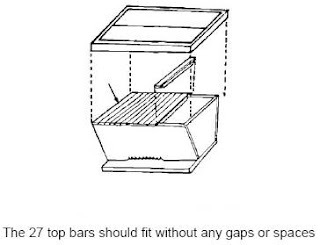 The volume of the brood box should equate roughly with the volume of the cavity occupied by wild-nesting honey bees.